With Eduardo Rodriguez (pictured, right) making a stellar MLB debut and Brian Johnson tossing six perfect innings this week, Chris, Matt and Ian of SoxProspects.com talked about the present and the future of prospect pitchers knocking on the door of the majors in the latest SoxProspects.com podcast. SoxProspects.com Director of Scouting Ian Cundall took an in-depth look at some of the top bullpen arms in the high minor league levels of Pawtucket and Portland. Cundall says Pat Light's move to the bullpen has revitalized his career after struggling as a starter. A former supplemental pick in the first round of 2012, Light has rediscovered his splitter and has used the pitch to great success. He also discusses Jonathan Aro, Kyle Martin,and Zeke Spruill, among others. Cundall also wrote the latest Scouting Scratch on the progress of left-handed pitching prospect Henry Owens. While some expected Owens to be the first pitching prospect to make the jump to Boston this year, he has struggled with his control so far. He has walked 35 in 54 1/3 innings in 2015. Cundall said he has struggled to locate his fastball, but has had great success with his "double-plus" changeup and his curveball. 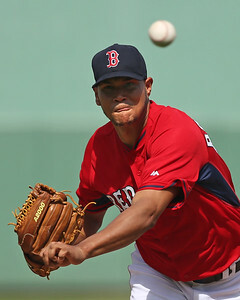 Plenty of media outlets gushed about the major league debut of top pitching prospect Eduardo Rodriguez. Christopher Smith of MassLive.com called it the "biggest bright spot so far in a negative 2015 season." The Boston Herald re-printed an article for Rodriguez's debut in which Scott Lauber spoke with Portland pitching coach Bob Kipper. 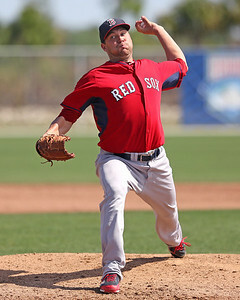 The Double-A coach discussed how Rodriguez immediately wanted to work on improving his changeup when he was traded from Baltimore to Boston in 2014. Rich Levine of Comcast Sportsnet went so far as to say Rodriguez could save Boston's season. Top position prospect Blake Swihart spoke to ESPN about his former minor league and current major league teammate Rodriguez and how the 22-year-old lefty can help the Red Sox. Swihart also spoke with Christopher Smith of MassLive.com about his relationship with his older half-brother, an Iraq veteran, who Swihart calls his hero. Ryan Hannable of WEEI.com's Full Count blog spoke with 20-year-old Greenville infielder Mauricio Dubon about his journey to America from Honduras at age 16. A Sacramento-based Christian mission group that brought baseball supplies to Honduras spotted Dubon's talent and invited him to move to California to play the game. Hannable also writes about Salem pitcher Aaron Wilkerson getting signed after playing in an independent league. Jim Donaldson of the Providence Journal argues that the Pawtucket Red Sox should stay in Pawtucket at McCoy Stadium. He adds that proposed renovations to McCoy should only cost about half of what the recent feasibility study suggested at $65.8 million. Brian MacPherson of the Providence Journal said that Allen Craig is starting to look like his old, All-Star self again in his time in Pawtucket. He has shown patience at the plate and has come up with some clutch hits in late innings, MacPherson said. Just a week away from the MLB draft, Keith Law of ESPN says the Red Sox are eying Arkansas OF Andrew Benintendi in his latest mock draft. Johnson (pictured, right) was absolutely dominant in his outing against Louisville this week. He needed just 74 pitches to shut down his opponent in six perfect innings. Of those 74 pitches, 50 were for strikes. Tekotte tore it up in limited time last week for Portland, as evidenced by his 1.688 OPS in 18 plate appearances. He also created 10 runs on the week for Portland. The former San Diego Padres draft pick is now hitting .272 on the season.